Will MQD spending impact availability of low level award seats & more going forward? I sorta know a few things about the airline we love to fly. After enough time you get a “feel” for the way things work. Almost two years ago I did a post about the “real” names behind medallion status and with MQDs this has proved all but prophetic. This is speculation on my part but let’s break it down. Delta has clearly demonstrated one thing you can do to be valued by Delta is spend spend spend. Not just spend, but do it only on Delta. Partners, careful, many times unless code share you are not showing Delta love! We already know that Delta loves AMEX and AMEX loves Delta. Delta is happy when you get a Delta AMEX and will often times, as blogged in the past, give up more low level seats to AMEX card holder (this is tidbit #1). Also with AMEX, we know they give more upgrades to Reserve card holders (as CWSI.net shows you ). I am near 100% as a Diamond Medallion on upgrades this year, and I know many Diamond Medallion do not have the Reserve card and complain that they might as well be Platinums since their upgrade percentages are so low (this is tidbit #2). I have no proof of this, but I see the trained response by crews and other Delta employees to million milers (they know who you are). I am getting closer to million miler status and would love some feedback if you have found more low level seats after crossing the 1 or 2 or 4 million mark. If you have not yet, don’t be shocked if you see this moving forward. This seems to be an achievement the airline is focusing on now (this is tidbit #3). We also know for a fact that the higher up the medallion ladder you go the more low level seats Delta does release to us. I have been shocked at how many more low level seats I can find as a Diamond compared to the lower medallion ranks (this is tidbit #4). We now get to the point of this post. 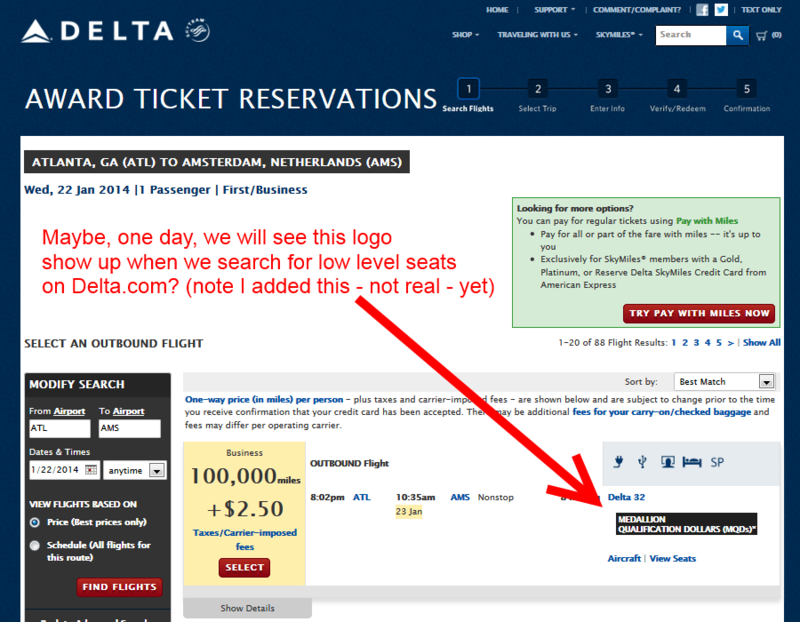 Delta is prominently displaying your MQDs on your My Delta home page . Each ticket you buy now shows your MQD estimated spend. 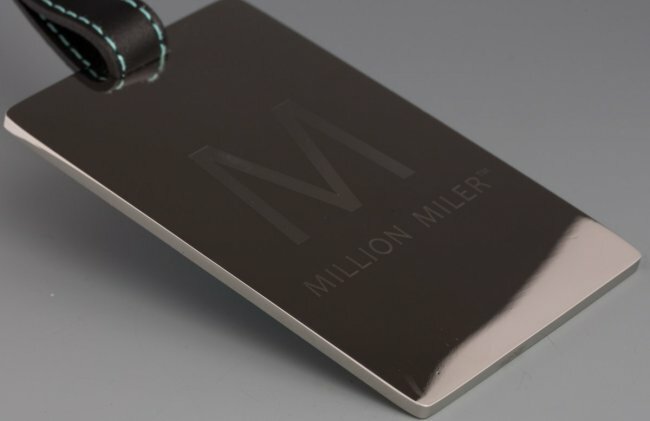 My bet is soon either by rank or some way (like the new handsets), just like your medallion status or your million miler ranking, ALL the Delta employees will see if you are a HVC that is a high value customer who has a BIG MQD number with the airline this year. Additionally, since we already know Delta loves to award more low level seats to those who are AMEX loyal and high medallion rank, how simple of a thing will it be to also reward those who spend the most with the most access to low level seats? Just how far can Delta take this? Truly the sky’s the limit! Boarding is already a messy train wreck so don’t see that as a perk; plus I think most would not like it announced to the world they are Deltas biggest cash cows spenders. But could this be yet another tiebreaker for upgrades? Maybe. What about OP-UP’s that is operations upgrades on international flights when coach is oversold? Why not do this (at least from the USA-overseas as we know coming back is just a mess). Who knows what else they could play with with these numbers but my guess is we are going to see a ton more in this regard when it comes to perks and favors. While I think some of your posts are very informative, ones like this are pure speculation and only serve the purpose to think there is some giant conspiracy theory at Delta. Stick with the facts. Good insight into the thinking of our favorite airline and where MQD is heading…What do you think about status earned purely by AMEX spend? will this also make you a HVC?? I’m not sure this is really even the issue. The MQD requirement will almost certainly radically reduce the number of high level people in the system. For example, I’ve been Gold for years and have already qualified for 2014. But looking at my spending over the last few years, in none of my Gold status years have I spent even close to the $5000 minimum. A few I’m not even sure I spent $2,500. With partner flights barely counting (one of my very expensive KLM flight this year earned me nothing in MQDs) the obvious implications here are shaking lots of people out of the system. The only good news is that maybe Silver status will emerge to be more like Gold is now – actually meaningful. I am finding my MQD number interesting. When looking at my MQDs, after 132 segments so far this year, I see I am equavalient to a person who pays for business class for very few JFL-LHR roundtrips. My thought is who will Delta look at as the better HVC? DM, 3.5MM and I have a hard time finding the lowest award tickets. Am I missing something? I came over from NW and had just over one million MQMs when the million-miler program started. I have been Delta DM for the last several years. If I get more low-level international seats than others, they must not be getting any because I see very few. Domestically, the supply of low-level seats seems generally good. I think you are right about Delta. For them loyalty = $$$ period. Rene, as someone 100K from DL million miler status and a current Platinum (who was 12th on the upgrade list on a Sunday flight from SFO-MSP this month), it’s hard to see the value in that status, when all the useful perks come from just holding a DL/AMEX credit card. I hear rumors Silvers have been known to be upgraded, but maybe that was in the old days, when NWA flew 747s MSP-TPA and DL flew L-1011s ATL-DFW. @Greg – no conspiracy theory – but I do tend to have a good feel for what is next! I have to be honest and say that, no, I have not noticed more low level award seats. My husband is a million miler+ with both a reserve card and a platinum card. I think we have used his miles once in the last ten years for a free ticket for him; we use his miles strictly for me to fly occasionally with him on interesting business trips. I make the mistake of looking for a free seat by checking the box, yes, I am traveling, just to see if I can find if a low level ticket is available before then looking by I unchecking that box. The cheapest “miles” I can find for him is 32500 miles and 40000 for me. I’ve thought that was only because we now have to fly a connection anywhere we go since we no longer live in Atlanta but I’ve come to believe that that’s just the way it is. Because I fly so infrequently, we always have enough miles to get the free ticket. I will say that it also makes me extremely mad that the award calendar will say that I’m trying to fly on a low level day but there are no low level tickets. In deltas defense, my husband does get upgraded more times than not but he’s also usually flying on an expensive ticket because he rarely gets to plan his trips in advance. Its maddening but what I’ve come to expect so I grit my teeth and get my ticket. I am more upset that delta won’t let me hold an itinerary even if for only 24 hours. The computer system should be capable of throwing unclaimed tickets back into the system when the hold expires instead of having to book the ticket and then cancel it if you don’t want it. I imagine there is a hidden reason for doing this – delta is hoping you forget to cancel within the window of 72 hours before the flight and thus you lose miles. Sorry for the long post but ultimately delta has frustrated me for a long time but I stick with them because I don’t have very many choices. Hopefully, southwest is going to give me more choices!